Authentic Indian Fry Bread Recipe is a classic Navajo recipe that is so easy to make and completely delicious! The dough is deep fried until golden brown and covered in savory or sweet toppings to enjoy! 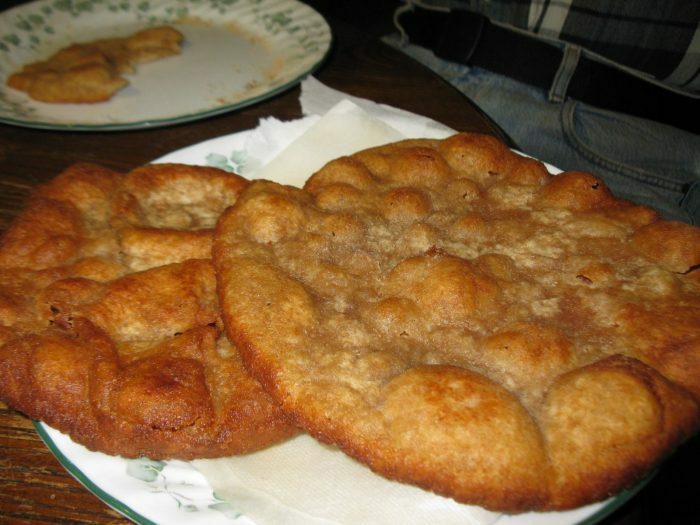 Fry bread is one of those things that is so amazing, but so few people know about it! I first discovered it last time I went out west when I ordered a Navajo taco, curious about what kind of spin on a classic Mexican meal it would be, and it came out flat on what looked like a deep-fried tortilla. Intrigued, I bit in and was amazed by the texture of the shell of this taco! It was light and crispy on the outside and a bit denser, more bread-like on the inside. It complemented the rest of the fixings on the taco perfectly! previously mentioned Navajo tacos, which are fry bread topped with ground beef, cheese, lettuce, black olives, tomatoes, and sour cream. Exactly like a normal taco but just with a more fun shell! Other options for things to put on top includes shredded chicken, steak, pork carnitas, etc. Personally, I had one with a bit of pepper jack cheese on top and it was a great lunch! Now the sweeter version is a completely different ball game! This version is a wonderful dessert that really reminded me of Spanish sopapillas! The honey seeps into all of the nooks and crannies of the fry bread and it’s wonderful!